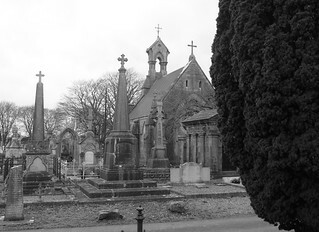 A graveyard with Limerick people interred therein is probably in Limerick, or is it? Looking pristine and well tended I wonder how it looks today? Who was Robert Potter and Fitzgerald? [https://www.flickr.com/photos/swordscookie] You can take the man out of Limerick, but not the Limerick out of the man!! [https://www.flickr.com/photos/beachcomberaustralia] We need a Limerick about Limerick!! Déja vu for the 2nd day running, it's like ... déja vu or something. Creating a limerick a day Should help keep dementia away Finding words that will rhyme And sound right each time Can be… What’d I say? Streetview is from 2014 when the work [https://www.flickr.com/photos/swordscookie] refers to was ongoing. [https://www.flickr.com/photos/gnmcauley] I was thinking this one looked familiar. I can see this in 3D by uncrossing my eyes. It gives you a headache after a while. Thank you for sharing this excellent stereo pair.